LUSAKA, 11 August 2011 (IRIN) – Charity Muyumbana, 45, has spent her entire adult life contending with recurrent flooding, poor drainage, and a lack of toilets in Kanyama, the sprawling Lusaka township where she lives. “Most of the people use plastic bags to relieve themselves during the night. They find it more convenient because some toilets are up to 200m away from the house,” she told IRIN. The situation in Kanyama represents a countrywide problem. According to a 2008 study by local NGO the Water and Sanitation Forum, only 58 percent of Zambians have access to adequate sanitation and 13 percent lack any kind of toilet. While the government has improved water and sanitation in urban areas, this is not the case in unplanned, high density peri-urban settlements like Kanyama where residents complain that lack of space and poor soil make it difficult to construct latrines, and a haphazard road network has contributed to a serious drainage problem. The over-used existing latrines attract vermin, and in the rainy season overflowing sewage pollutes wells causing water-borne diseases like diarrhoea, dysentery and cholera. A 2006 study of the water supply and sanitation situation in 570 peri-urban and low-income areas of Zambia carried out by the National Water Supply and Sanitation Council, a government agency, found that Kanyama was by no means unique. Kanyama’s poor drainage has made it prone to cholera during the rainy season, but a partially completed project by the government to construct a proper drainage system in the township was abandoned in October 2010. 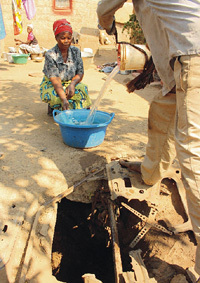 According to research by the Civil Society for Poverty Reduction (CSPR), a local network of civil society organizations which advocates pro-poor development policies, the Treasury allocated 20 billion Zambian kwacha (US$4.05 million) for the construction of the drainage system, but only a fraction of that amount was paid to the contractor who completed about a third of the project. She added that there had been no attempt by the government to investigate the apparent misappropriation of funds. Other observers note that 90 percent of Zambia’s water and sanitation budget comes from development partners including the World Bank and Water Aid. “It would be pleasing to see government step up in terms of its own budget line,” said Barbara Kazimbaya-Senkwe, a water and sanitation specialist at the World Bank which has loaned the government $22 million to improve water and sanitation systems in Lusaka Province. She added that the government had put in place a number of policies to improve the delivery of water, especially in rural areas, where, according to the World Bank, only 13 percent of the population has access to good sanitation facilities, and 58 percent to clean drinking water. One reform has been the removal of water budgets from local councils to ensure money is ring-fenced for the purpose of extending supply networks. “The reform process has yielded some positive developments, but I can say there is still a lot of work that needs to be done,” Kazimbaya-Senkwe told IRIN. Evans Chinyemba, a Catholic bishop in the Mongu Diocese in impoverished Western Province, said the water issue was “one that needs to be paid attention to”. “We have a lot of rivers in Western Province… I think we have not tapped into those resources so that we can provide proper water to our people,” he told IRIN. He added that while government was digging boreholes in some areas, they had not reached the whole province. Government expenditure on rural water supply remained at a low level between 2005 and 2008, according to the 2010 Public Expenditure Review, conducted by the government of Zambia, the World Bank, the African Development Bank, and other cooperating partners. A government source who asked to remain anonymous said some progress had been made in providing clean drinking water and improving sanitation. However, the biggest challenge was lack of funding. “There has been little or no progress towards the agreed target set by the government in its Fifth National Development Plan of allocating 3.5 percent of the national budget to water and sanitation. Sanitation has always been the most neglected and off-track of the Millennium Development Goals, with little funding or political will to address the crisis,” the official told IRIN. Diseases related to poor drainage and polluted water supplies, such as malaria and diarrhoea, are major health problems in Zambia with diarrhoea accounting for nearly 7 percent of all reported illnesses and malaria claiming 50,000 lives a year (23 percent of all deaths in the country), according to the United Nations Development Programme (UNDP). This entry was posted in Africa, Progress on Sanitation, Sanitation and Health and tagged Millennium Development Goal, Water Supply and Sanitation Collaborative Council, Zambia. Bookmark the permalink. The ZerH2O Waterless Toilet is the ‘futuristic’ answer to household sanitation. No big digging for installation and can be retro-fitted into almost any structure. It is compact, sealed, safe, convenient and the humane alternative sanitation unit for urban and rural areas. Check the website and contact me for more information.